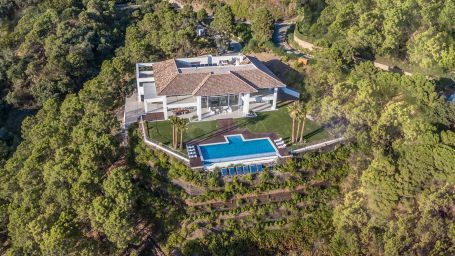 A new luxury villa for sale in La Zagaleta, with the hallmark of this prestige company, which always offers properties with the highest standards of quality and design, in a dreamlike natural setting, within the most exclusive urbanization of the Costa del Sol. This impressive villa with modern architecture, set on one of the loveliest valleys of La Zagaleta, offers you the best views of the lake and the New Golf Course. Start each day with coffee or tea on any of its open terraces overlooking the swimming pool and garden; host an unforgettable family or friend gathering in its ample dining room and relax after an intense day in its outstanding spa area which includes a generous heated indoor pool, private massage room, sauna and steam bath among other luxury facilities. It is the perfect house to enjoy the luxurious lifestyle in Marbella. Please, send me more information about ref 359-00028P in La Zagaleta, Benahavis or similar properties.